Denver Gym Crowd! Want to melt off stubborn fat areas permanently? Everyone hates their Muffin Tops & Love Handles. Did you know Body Massage Wellness Spa in Downtown Denver now offers the world’s leading non-invasive fat removal treatment, CoolSculpting? CoolSculpting is an FDA-cleared medical procedure that freezes away unwanted fat permanently without surgery or downtime. Since adding the fat removal service to our menu in early 2018, we’ve observed that CoolSculpting is particularly popular among the gym crowd and those who exercise regularly and are physically fit. What is the motivation? If you’re really into your body and work out regularly, and have been dedicating hours to the gym trying to remove that STUBBORN BULGE, you might find that the mirror still reflects an isolated fat bulge you can’t get rid of, no matter how hard you try. Now there is a solution. With CoolSculpting, it’s never been easier to transform your body. Our CoolSculpting specialist will answer all of your questions and help you learn more about CoolSculpting and what to expect. And during your free consultation, our specialist will assess your needs and tailor your treatment to achieve your desired results. CoolSculpting treatments are so easy and quick, you can schedule your treatment during your lunch hour, and head back to work or gym or to run errands, or get to your other appointments. Its that fast and easy! from physically fit to slender framed and some heavier candidates as well. For example, there are skinny people who are also interested in CoolSculpting. Like the physically fit, they may appear thin, but have a stubborn fat area that may be bothersome. With CoolSculpting, we can eliminate the fat bulge and give our clients the image boost they desire. We also treat some heavier people, where CoolSculpting offers an extra boost of encouragement with visible results. No matter what size or proportion, often we just need a little motivation to feel better and nudge us to adopt a lifestyle change toward better health and wellness. At Body Massage Wellness Spa, we start with a free consultation to explain how CoolSculpting works and answer any questions. During the consultation, we set realistic expectations depending on the volume of fat elimination that is desired. Some candidates may require more than one treatment to reach their goal. Others may need only one treatment if its a smaller volume area. We go over all of that in our initial consultation and set the goals that fit the desired outcome. Most patients see results from an initial treatment in 1 to 3 months, depending on their own body, their nutritional intake and other parameters. But each patient has up to 4 months to lose those fat cells. So if we’re scheduling more than one treatment, we generally schedule the second treatment at the 2 month mark. At 2 months you can actually see the bulge go down and that gets patients real excited and so it encourages them to do that second session or even a third or more. Some people just need just one treatment but again, it depends on what volume of fat you want to eliminate and what your goal is. Besides the mid-section of the body, people like to treat the arms, the back area and the flanks which are on the waist toward the back. The chin or turkey neck area is another real popular area to treat, and actually can transform the patient to shave years off, appearing more youthful. This is a very visible area and people don’t like the way it makes them look so more and more people are treating the neck and chin area. Those who may not be candidates would be people with visceral fat. So if you have that hard, big belly, un-pinchable subcutaneous fat, you’re not a candidate. Thats more internal fat and we cannot treat that with CoolSculpting, so diet and exercise may be a better solution initially. If a person is really really heavy and has ALOT of fat volume, CoolSculpting is not the right solution and a different type of fat elimination treatment is necessary. Since we’re all about health and wellness here at Body Massage Wellness Spa, if we are meeting with someone who is not a candidate for Coolsculpting treatments, we can still help with other solutions. We might suggest a Biofeedback Therapy scan, to see whats going on with your overall health and wellness, and then discuss some alternatives therapies like a cleanse and detox or a specific wellness protocol designed to breakdown visceral fat internally and combine body contour wraps with Zerona Verju Lipo Laser, another non-invasive treatment, taking a different approach to fat elimination. We definitely take care of every single person who visits our spa and if you are not a candidate for CoolSculpting, we don’t just send you out the door. We have a multitude of other health and wellness options to help you move forward with a desire to look and feel better. Body Massage Wellness Spa has the ability to dual sculpt and we’re the only location in Downtown Denver with that capability. That means we have two machines so we can treat two areas at the same time which can cut overall treatment time. Not a lot of places have two machines but in Downtown Denver, you’ve got that option. Worried about parking? No worries. When you book Coolsculpting treatment at our Downtown Denver Med Spa, we always provide free parking for our guests at the nearby Pavilion Parking Garage. Click Here To Take Advantage of our CoolSculpting Seasonal Specials. If you’re struggling with stubborn, unwanted fat and your clothes are not fitting the way they use to, check out CoolSculpting at our Downtown Denver Day Spa. CoolSculpting is the world’s newest, safe way to get rid of unwanted fat bulges. 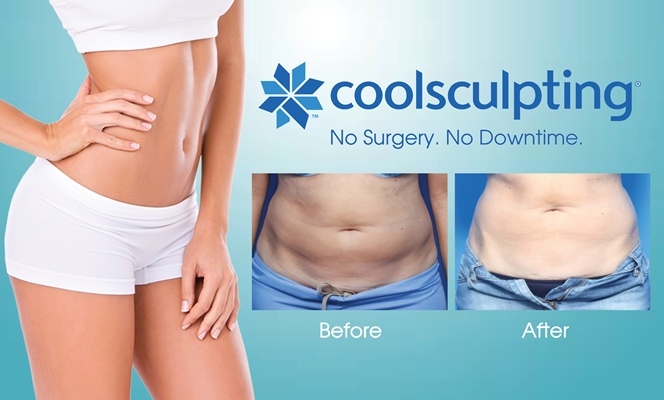 With CoolSculpting, its never been easier to transform your body. Call us today at Body Massage Wellness Spa to schedule your free consultation.